Coverage: Watch live coverage of selected days on BBC Red Button, BBC Two, online and BBC Sport app. Full details here. Lizzie Armitstead won silver and Alex Dowsett claimed bronze in the trade team time trials at the Road Cycling World Championships in Virginia. 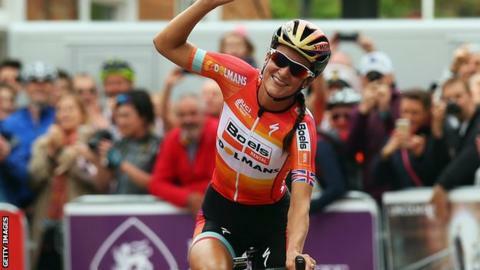 Armitstead's Dutch-based Boels-Dolmans team finished six seconds adrift of German outfit Velocio-Sram who won in 47 minutes 35.72 seconds. Dowsett's Movistar squad was third in the men's race as BMC Racing won a second straight title in 42:07.97. The riders now switch to national team colours for the event in America. The women's individual time-trial takes place on Tuesday with the men's race the following day in which Commonwealth champion Dowsett will compete. Armitstead will lead the British women's road race squad on Saturday with the men's event on Sunday 27 September. Britain's two-time Tour de France champion Chris Froome and 2011 world champion Mark Cavendish are injured and will miss the race, while Geraint Thomas has withdrawn as he did not feel "physically" up to it.